This past Tuesday, HELEN MILLS was home to Data & Society's 'Practice & Challenge event which brought together the research institute's community to hear from journalists, activists, investors, and others about their most recent work. The event spanned both venues and featured examples of recent work as well as some wonderful branding and decor (photos below). Click here to learn more about the event and organization. Above: The space was simply decorated to give the spotlight to the work being showcased. The columns were wrapped with LED string lights to accent the architectural features. The organization branded all parts of the space using, from the top: 1) signs for table centerpieces, 2) gobo projections, 3) posters hanging from the space's gallery molding, and 4/5) exterior signage in the venue's portholes as well as the sidewalk showcase. For their NYC Data Asset Management (DAM) Summit in New York, Canto did a wonderful job mixing in what you expect at a conference: great speakers, content, and networking opportunities, with the unexpected: humor, moments of delight, and GIANT Connect Four & Jenga. The result - engaged attendees and a memorable day and night. Check out a few of the photos below for more details on what made the event so special. Above: Giant Connect Four with the brand's signature blue color was a big hit during the evening cocktail reception. Giant Jenga was also a hit at the reception and allowed for attendees to mingle over a little friendly competition. Above: Canto's brand color served to accentuate the space without feeling overly branded. Details included the wall wash color, table linens, and of course signage placed throughout. The event organizer's gave a nod to Mother's Day with some 'left-over' handmade artisan chocolates from the chocolatier Jaques Torres. They were a big hit among guests and an unexpected thank you for those who traveled on Mother's Day to attend the event. Below: The entrance to the event was decked out in Canto colors. The effect was an eye-catching and wonderful to photograph display of both Canto and it's sponsors branding. Many social media posts of the day featured the exterior branding. Above: Taking a closer look, Canto mixed humor into their signage - a nice touch for a conference and a welcome change for attendees. Who knew a Data Asset Management conference could be so fun and filled with surprises. Want to learn more about Canto? Check out the company's website with event speakers, topics, and other details. Planning a Conference? Contact us or check out more recent meetings & conferences here and below. Indoor Ag-Con, the US indoor agriculture’s industry’s leading conference, hosted their first New York conference at the HELEN MILLS Event Space and Theater. The one day, fall event featured 12 industry leaders discussing their visions, from bringing open source big data to farmers and hydroponic growing techniques. Speakers included CEOs from See Jane Farm, Agrilyst, Sundrop Farms, BrightFarms, and more. In addition to gathering great talent, the event was brilliantly produced. Below are some of the highlights with accompanying photographs. The event planning team used fun, eye-catching graphics to brand the event throughout the venue. From portholes on the venue doors (pictured below) to gobos to attendee gift bags, the team didn't miss an opportunity to communicate with guests. A wider view (below) of the event's signage which utilized HELEN MILLS' street-level door portholes and sidewalk showcase. The portholes features the partner logos, in addition to the event's branding. The event featured 12 keynotes from industry leaders in the HELEN MILLS Theater (below). While most of the attention was focused on the speakers, guest were welcomed to the presentations by individual gift bags with fun giveaways and groundbreaking industry research. The lunch featured unique centerpieces: hydroponically grown radishes and beets grown by one of the event organizers. These were not only unexpected but were a perfect match for the topics of the day. The apples brought an intense pop of color. 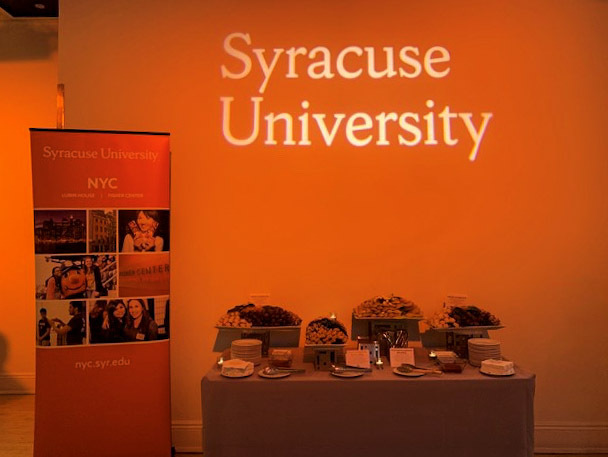 The event was catered by the talented Harvest Real Food Catering, who sources many of their ingredients from the nearby Hudson Valley. The meal was wonderfully put together, from the butter dish garnished with a fresh sage leaf (below) to the mouth-watering French cut cider braised chicken breast with roasted brussel sprouts. For More information on Indoor AgCon check out their website.